Sign-ups for volunteers will become available in 2019. From this direction there are two Fish Hatchery Road exits. Take the first one, Exit 260A (County Road D) headed south onto Fish Hatchery Road. It’s right after the Todd Drive Exit. At the stoplight, turn right (south) onto CR-D/Fish Hatchery Road. Drive 2.3 miles to E. Cheryl Parkway and take a left. The Agora will be on your left; you’ll see the big white tent. Follow the attendants to parking. Just after the Park Street Exit, take Exit 260A-B (County Road D) to Fish Hatchery Road. At the stoplight, turn left (south) onto CR-D/Fish Hatchery Road. Drive 2.3 miles to E. Cheryl Parkway and take a left. The Agora will be on your left; you’ll see the big white tent. Follow the attendants to parking. Take Exit 142A to merge west onto Highway 12/18 (“The Beltline”). 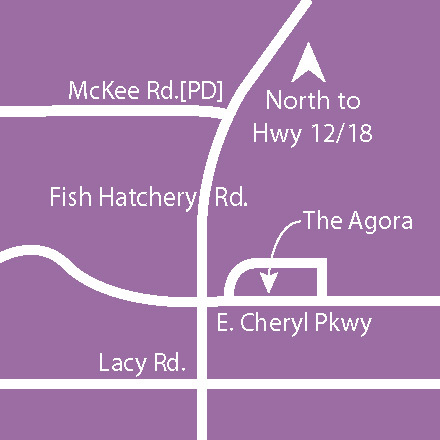 Just after the Park Street Exit, take Exit 260A-B (County Road D) to Fish Hatchery Road. At the stoplight, turn left (south) onto CR-D/Fish Hatchery Road. Drive 2.3 miles to E. Cheryl Parkway and take a left. The Agora will be on your left; you’ll see the big white tent. Follow the attendants to parking. Take Exit 142A (a left exit!) to merge west onto Highway 12/18. Just after the Park Street Exit, take Exit 260A-B (County Road D) to Fish Hatchery Road. At the stoplight, turn left (south) onto CR-D/Fish Hatchery Road. Drive 2.3 miles to E. Cheryl Parkway and take a left. 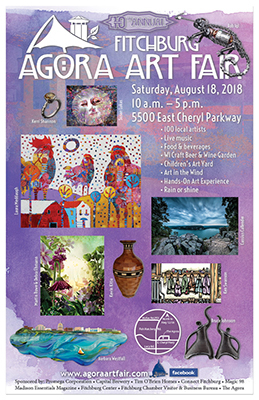 The Agora will be on your left; you’ll see the big white tent. Follow the attendants to parking.